Templates are the framework that defines the appearance and layout of Arena sites. Templates are in HTML inside of an ASP.NET page and allow a huge amount of versatility both in their own content and design and in the design of your website. The HTML format of templates is coded in C# and is saved as an ASP module file (.ascx). While the majority of your website uses the same template file, you may encounter a few pages where you want to use a different template, such as the home page on the Arena-managed external website. Arena includes default templates used throughout the application with available alternate templates. 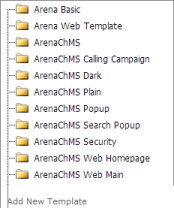 The template files are located in the ~ArenaChMS/Arena/Templates folder on the web server. There are several additional templates available in this folder. To apply a template to a page, you first need to add the template to the Arena/Templates page. If you elect to edit an existing template, it is recommended to first click the Pages tab of the template to review all pages that use the template. Any changes made to the template applies to all of the pages. 1. Go to the ArenaChMS folder on the Web Server. 2. Add the new template file to the ArenaChMS/Arena/Templates folder. 3. From the Administration menu, click the Templates option located under the WEBSITE heading. 4. Click the Add New Template link. Arena creates a placeholder needed to map to the new template file. 5. Click the Edit Details button for the new template. 7. Click the Update button. You can now add modules to the content areas of the template itself or apply the template to an existing page. 1. Go to the desired page. 2. Click the Edit Details link on the Page Details tab. 3. Select the desired template from the Template drop-down. 4. Click the Update button. Often when you change a template, modules are misplaced. If this occurs, Arena adds a new tab with the misplaced modules. You need to resolve the misplaced modules before proceeding.